It’s a Joyful Holiday Weekend in Calistoga! 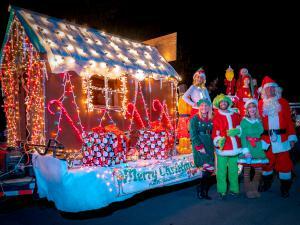 CALISTOGA, CA, UNITED STATES, November 8, 2018 /EINPresswire.com/ — Bring your loved ones to the winter wonderland of Calistoga on Friday, Nov. 30 through Sunday, Dec. 2 for a fun-filled weekend packed with holiday festivities. The celebration begins Friday, Nov. 30 at 4pm with face painting, ornament making and more fun for the kids at the Calistoga Holiday Village Tree Lighting, presented by the Calistoga Chamber of Commerce and the City of Calistoga. Enjoy house-made gumbo from Evangeline, holiday treats and beverages, and sip on Calistoga wines in the Calistoga Winegrowers’ North Pole Wine Garden. After the tree lighting, follow Santa Claus on his lighted tractor over to the Mount View Hotel for photos. Gift shops along the main street will stay open until 8pm so you can kick off your holiday shopping. Stop into downtown tasting rooms to “follow the gingerbread man” and vote for your favorite wine and gingerbread cookie pairings. Hop on the Holly Trolley for a complimentary Holiday Lights Tour of decorated neighborhoods with stops at the tree lighting, Calistoga Train Depot and West End Antiques District. On Saturday, Dec. 1 from 9am to 4pm, ride the Trolley between the Calistoga Christmas Faire (presented by Celebrate! Napa Valley) and the Calistoga Farmers Market in downtown. Enjoy a day filled with holiday festivities and booths filled with artisan goods while performers and players (carolers, dancers and more) entertain. The festivities culminate with the much-anticipated 23rd annual Calistoga Lighted Tractor Parade in a procession down Lincoln Avenue from 7-8pm. Be dazzled by the whimsical sights and sounds as 60 unique tractors, floats and farm equipment dance along downtown Calistoga under falling “snow”. Discover why the Calistoga Lighted Tractor Parade has been ranked #2 on Condé Nast Traveler’s list of “The World's Most Over-the-Top Christmas Parades”, and why USA Today has twice nominated the Calistoga Lighted Tractor Parade for a 10Best Readers’ Choice Award for Holiday Parades. The Calistoga Lighted Tractor Parade is an authentic representation of Calistoga's agricultural heritage and is supported by community residents and businesses. The parade is sponsored in part by Belkorp Ag, dck worldwide, Calistoga Spa Hot Springs, Davis Estates, Joseph Cellars, Napa Valley Vintners, Silver Rose Property Owner LP, von Strasser Family of Wines, Cafe Sarafornia, Calistoga Realty Company Inc., Crystal Geyser Water Company, Garton Tractor, Huge Bear Wines, Nadalie, Ole Health, Rabbit Rabbit Fair Trade, Romeo Vineyards & Cellars, Silverado ACE Hardware, Six Sigma Ranch & Winery, Sterling Vineyards, UpValley Inn & Hot Springs, Baldacci Family Vineyards, Blackbird of Calistoga, Calistoga Inn, Dutch Henry Winery, LeRoy E. Bowser, D.D.S., Petrified Forest Vineyards and Shaw Plumbing. Saturday, Dec. 1 is one of the busiest evenings of the year at Calistoga restaurants, so be sure to reserve your dinner table before the Calistoga Lighted Tractor Parade begins promptly at 7pm, with a special appearance by Santa Claus! New to the festivities is Holiday Brunch Menus on Sunday, Dec. 2. Be sure to check CalistogaHolidayVillage.com for details on participating restaurants! For information on lodging packages to enjoy the full weekend of festivities, go to CalistogaHolidayVillage.com or call (707) 942-6333. You can also find event information on Facebook at Facebook.com/CalistogaVisitors. The city of Calistoga is a Napa Valley town known for its natural geothermal waters, popular spas, relaxed atmosphere, adventures hiking and biking trails, wide variety of wineries and great dining. For online information about lodging and dining options, local wineries, spas and events in Calistoga: VisitCalistoga.com. You can also find Visit Calistoga on Facebook at www.facebook.com/CalistogaVisitors, Twitter @VisitCalistoga and Instagram @VisitCalistoga.